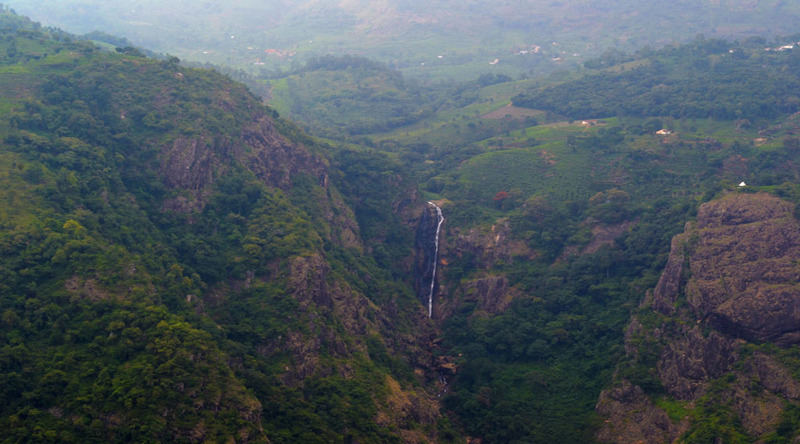 The caveat is that reaching this heavenly spot requires a moderate level 3 km long trek through the pines and rocks of the Palani Hill Range. It is possible to explore a nearby waterfall and a local village along the way. Perhaps the most captivating scenario would be if you happened to visit Dolphin's Nose when a mystical fog has covered the mountains and surrounding valley. A quiet retreat into the mountains is a splendid way to engage in some soulful introspection or wonder while the experience itself can be enhanced multi-fold during a sunrise or sunset. The peace and tranquillity in the atmosphere are second to none. It is possible to explore a nearby waterfall and a local village along the way. Fruit juice vendors and food stalls occasionally dot the landscape, but the items are relatively expensive up here. Overall, Dolphin's Nose constitutes a half-day trip into the mountains for a rejuvenating morning (or evening!). Dolphin's Nose viewpoint is a must on the itinerary of those looking for an adventurous add-on on their visit to Kodaikanal. Photography enthusiasts may also enjoy taking some landscape clicks from this beautiful viewpoint. Famous For: Tourism, Photography and trekking. Entrance Fee: No entry fee is required. Visit Duration: Approximately 2-3 hours trek up and down and spending time over there. Apart from the peaceful weather and the hills of Kodaikanal, the Dolphin’s nose is major tourist attraction. It is mainly famous for its scenic beauty and breathtaking view from there. People who love adventure prefer trekking up and down, since it would be a nice view all along the journey. Be careful if you are travelling with children because of the terrain and the presence of mischievous monkeys. It would be advisable to carry your own liquid foods there, since it would be tiring enough a trek and might make you shell out more money than the original price if you are to buy the same fruit juices up there. The tip of the cliff would no doubt be one whole enthralling and thrilling enough to make you have enough clicks for a life time. There’s a village at a certain distance where one can visit after you are done with the main. However, people need permission from the forest department to do so. Don’t forget to have hot and spicy noodles overlooking the misty scenery in the restaurants there. The nearest airport to the Kodaikanal, Dolphin’s Nose is Madurai Airport which is at a distance of about 120 kilometers. From there, you can take a bus or book a cab to reach the city of Kodaikanal. The dolphin’s nose is 8 kilometers from the main town which would also include an addition 1.5 kilometers’ trek. The transportation facilities are smooth and this being a famous tourist place one wouldn’t face any transport related problem at all.If you are planning to travel by train, the closest railway station would be Kodai road which is a distance of 80 kilometers. If you are planning to visit Kodaikanal which actually has ample number of tourist spot, then make sure to have this spot on your list. This place has a unique serenity giving a breathtaking view, something which you surely won’t want to miss from your travel bucket wish list.